Mommy Monday: 14 Weeks Pregnant With Number Two! I hope you all had the happiest Easter! We had such a fun weekend! Saturday we had a lazy morning and we all watched Homeward Bound together in our jammies and it was just such a nice, cozy day. Yesterday, James and I went to church with my parents. Then later, Ben James, Gunner, and I headed to my parents' house for dinner with extended family and an Easter egg hunt for little James. It was James' first Easter egg hunt and he did SO well!! He loved it! My cousins set it up for him and it was the cutest most fun thing! 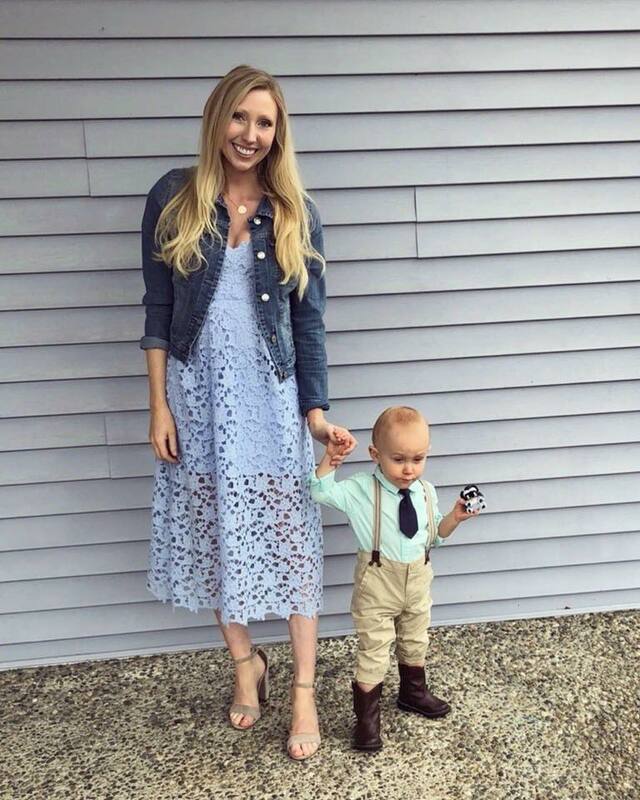 I was seriously dying over James' Easter outfit and how CUTE he looked!! His little tie was just the most adorable thing. I want to dress him up in fancy clothes every day!! His shirt is my favorite color - mint! And his slacks are a bit big so they will fit him for all of our events coming up through the summer! So, I am officially in the Second Trimester now!! Hooray!! This week, I'm getting my cerclage, so please send all your thoughts and prayers and good vibes my way! I'm pretty nervous for the surgery and just want to get it over with! Oh also, I found the BEST maternity jeans ever...seriously. If you're pregnant, GET THEM! They are really comfortable (like leggings), and are super cute and actually fit well unlike a lot of maternity jeans. They come in several colors/ washes. Click here for the jeans! Sleep: Not great - SO congested!! Best moment this week: James doing his Easter egg hunt! And watching James during the church service yesterday! He's so sweet! Movement: I *think* a few little flutters - but none that I'm absolutely positive about yet. I have an anterior placenta this time, so it will probably be harder for me to feel movement until later on. Symptoms: My weird dreams are gone, yay! Now symptoms include congestion, weakness, shortness of breath, and moodiness.